Choosing between the Chase Freedom® and the Discover it® Cash Back ultimately should come down to which of the two will provide you with the higher returns on everyday purchases. The two cards may differ when it comes to certain transaction fees purchase coverage benefits. However, these differences are almost always negligible, seldom differing by more than a few percentage points. By highlighting their differences, this guide takes an in-depth look at which person would be better off choosing either the Chase Freedom® or the Discover it® Cash Back. Which Card is Better on an Average Budget? * Even though the Discover it® Cash Back has no foreign transaction fee, the Discover network isn't as widely accepted in Europe and South America as Visa. In Asia, you can use the Discover network anywhere UnionPay, Diners Club International or JCB is accepted. The chief differentiating factor between these two offers is their rotating category calendars. The card whose calendar more closely aligns with how you spend your money throughout the year will be the better choice. Note that for both cards, the 5% bonus is capped at $1,500 in purchases (activation required). Once you reach that cap, the Chase Freedom® and the Discover it® Cash Back will both earn you 1% each until the next quarter rolls around. The Chase Freedom® tends to have more original categories fall into its calendar. For example, in past years cardholders received 5% at H&M clothing stores. By contrast, the Discover it® Cash Back tends to offer the same categories year-to-year, with little variation. There are two approaches to examining the rewards offered by the two cards: a short-term one and a long-term one. Depending on what type of credit card user you are, you’ll most likely prioritize one of these over the other. Unfortunately, neither card excels in both. 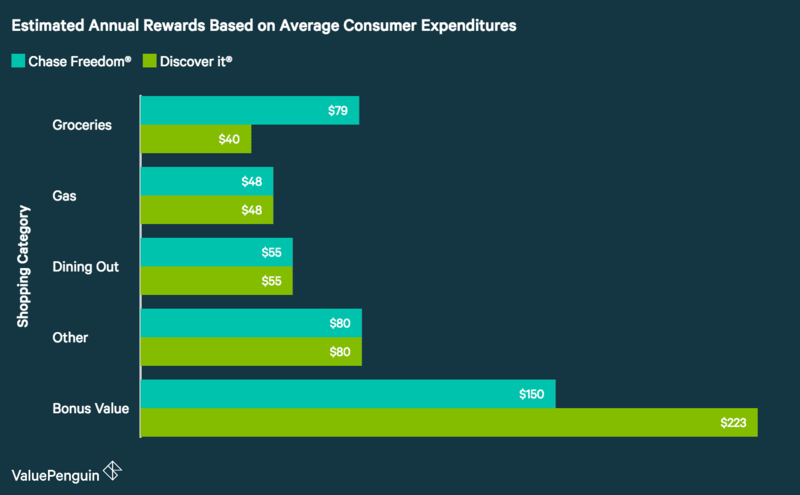 During your first cardmember year, the Discover it® Cash Back will almost always beat the Chase Freedom® from a rewards standpoint. This is because Discover doubles all the cash back at the end of the first year for new cardmembers. Therefore, the Discover it® Cash Back effectively acts as a 2% card on all purchases during the first year, and 10% in bonus categories, up to the first $1,500 in combined purchases each quarter whenever you sign up. The Chase Freedom® allows users to earn $150 after they spend $500 within the first 3 months of card membership. To match that, Discover it® Cash Back cardholders need to spend $1,500 in bonus categories during their first year. If you can hit that goal, then the Discover it® Cash Back will blow the bonus of the Chase Freedom® out of the water. If we look past the shiny sign-up bonuses offered by each card, the Chase Freedom® provides the best long-term value. All other things equal, the Chase Freedom® gives its users a better ‘currency’ in the form of Ultimate Rewards. With the Discover it® Cash Back you earn direct cash back on your account that you're always exchanging at a set rate. With the Chase Freedom®, users receive reward points that can be used for cash back or other prizes. These points increase in value if you sign-up for the Chase Sapphire Preferred® Card or the Chase Sapphire Reserve®. At that point, you gain the ability to transfer your Ultimate Reward points over to airline miles, which can boost the rewards rate on the Chase Freedom® to 6.25%, instead of the 5% standard. Therefore, by collecting Ultimate Reward points instead of pure cash back, you are making a smarter investment. If you choose, you can just as easily redeem your points for cash back – as you would with the Discover it® Cash Back. However, those who want have the ability to do much more with their points should get the Discover it® Cash Back. Which Card Is Better for the Average Consumer? The average consumer will be better off choosing the Chase Freedom®. We base this on the average expenditures data provided by the Bureau of Labor Statistics. This government body catalogs how much U.S. consumers spend each day, and in what categories. When you match those up with purchases that can be charged to a credit card, we can estimate the rewards provided by each card. In total, our model cardholder would earn $413 with the Chase Freedom® during their first year, and $263 per year going forward. The Discover it® Cash Back user would earn $446 year 1, and roughly $223 annually moving forward. Assuming your spending breaks down similarly to the above example, you will be better off choosing the Chase Freedom® in the long-run. For everyone else, it’s worth taking the time to inventory how you spend your money throughout the year. As you can see from the above example, the difference can be quite substantial between the two cards. Since both the Chase Freedom® and Discover it® Cash Back have no annual fee, a valid strategy involves applying for both. There are two main downsides to this approach. First, the two separate applications will result in two ‘hard pulls’ on your credit report. This will result in a slight decrease in your credit score, for a temporary period of time. Secondly, having two credit cards will require you to put more effort into managing your rewards. You’ll have to take care to activate the bonus categories on both cards each month, and make sure you pay attention to where you pay with each card. If you get both credit cards, you should use them to optimize earning the 5% bonus cash back. Whenever the two cards will provide you with an equal cash back rate, it is you are likely to benefit most by paying with the Chase Freedom®. This goes back to earning Ultimate Rewards points versus regular cash back. All things equal, you’ll be making the better reward investment by earning these points over standard cash back.